myfdc has been renewed for the 7th year. When it first started, the readership per day is hardly 10. It grew steadily especially after the Royal Visit in 2012. It is self funded and I rely on your support through FDC purchases to continue the site. myfdc was initially set up to create awareness on concordant First Day Covers. It has moved to provide timely and important information to support concordancy. The fringe benefit is that the information is also useful to the general collecting public of Malaysian Philately. myfdc relies on information shared by Pos Malaysia and the kinder sharing readers. Information which is timely is useful. Information which is old is just coffeeshop talk and of no value. I think you know how it is. myfdc will also only publish once the facts have been reasonably confirmed. Though there are last minute changes (which you can get a faster input at myfdc Malaysia Facebook page); by and large myfdc has been able to provide the information on time. By the end of today, myfdc will hit 590,000 views. I will run specials leading to 600,000 views expected sometime in January 2019! 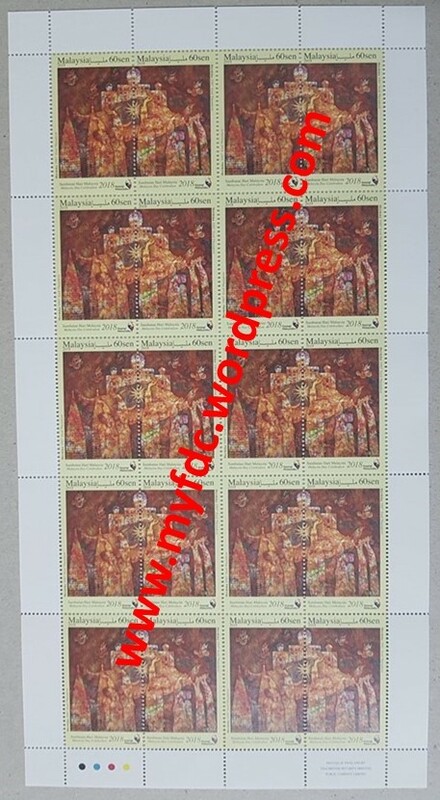 myfdc has been sending freebies on a flash basis, competitions, quiz, philatelic trips (for those who took up the offer) and various really great offers for high market price items at affordable (collectors’) prices. I hope to be able to continue this with your support. It is this year’s super HOT Malaysia Day setenant strip sheet. ONLY 1 sheet will be available for this deal via my eBay link. It is very hard to get the setenant during the Stamp Week queue and I am saving it for this promotion. Miss this and you can get it from dealers at RM 200 :-), you choice. Happy bidding and many thanks for reading myfdc!